BRUSSELS. 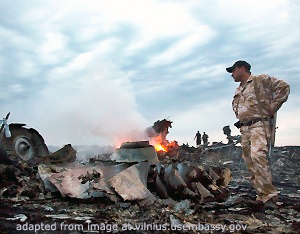 Sept 17 (Interfax) – The Joint Investigation Team (JIT) probing the downing of Malaysia Airlines Flight 17 (MH17) in Donbas in 2014 has taken note of the information concerning the crash publicized by the Russian Defense Ministry on Monday. “The JIT has requested the Russian Federation to provide all relevant information” since 2014, the JIT said in a statement on its website. “In May 2018 the JIT specifically requested information concerning numbers found on several recovered missile parts,” it said. “The JIT will meticulously study the materials presented today as soon as the Russian Federation makes the relevant documents available to the JIT as requested in May 2018 and required by UNSC resolution 2166,” the JIT said. “From the start of the investigation until today, the JIT has always carefully analyzed and processed the information provided by the Russian Federation,” it said. “An example is the alleged presence of a fighter plane in the vicinity of MH17 on radar imagery presented to the public on a press conference in July 2014,” the JIT said. Nikolai Parshin, the chief of the Russian Defense Ministry’s Main Rocket and Artillery Directorate, said on Monday that a surface-to-air missile launched from the Buk air defense system that downed the MH17 in 2014 was manufactured in Dolgoprudny outside Moscow in 1986 and sent to Ukraine, never returning to Russia.